1. My visit to the dentist didn’t involve a novocaine shot. 2. A guy on the street told me I was cute in a particularly sweet way. 3. I’ve actually lost too much weight, and I don’t want to exercise or swim less so that means EAT MORE. I had grilled cheese and french fries for lunch. 4. Went out to dinner after Teresa Carpenter’s reading last night, saw an old-friend, great dinner conversation with his wife. Oh, and another nice compliment at dinner about how I looked. 5. Came home to a dinner invitation from a friend who is a GREAT cook. 6. Positive response from Howard who looked at the re-worked beginning of my book. 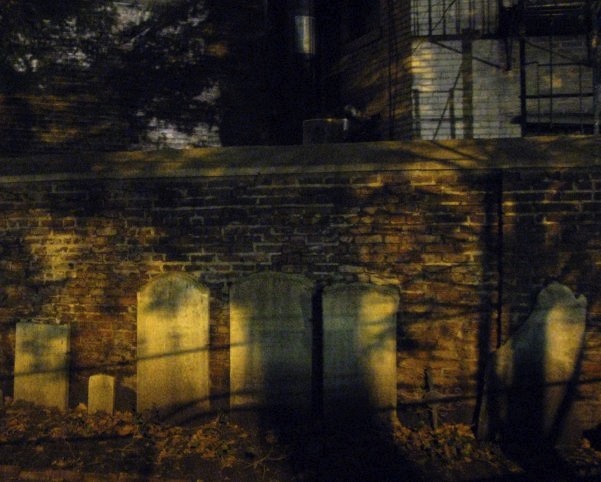 The Second Cemetery of the Spanish and Portuguese Synagogue on 11th Street, which I pass by almost every day. I took this Tuesday night on my way back from choir practice.